New York: Harper Audio, 1994. 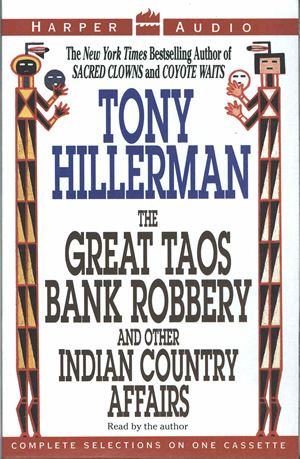 This is the first audio cassette book of The Great Taos Bank Robbery, which was published in 1994 by HarperCollins Publishers in New York City, New York. There are four cassettes and each side of the cassettes runs about 45 minutes (90 minutes total or 1 hour and 30 minutes of tape). This audio book version was read by Tony Hillerman himself. The audiobook has been recorded onto one audio cassette and includes a cardboard case with a full-color cover design. This cover design is by Peter Thorpe and features two elongated yei figures. The front cover contains: the publisher's name, the number of cassettes, and the reader's name.